Tags: Blue, Daily Wear, Light Yellow, Pink, Straight Trouser, Thread Embroidery. 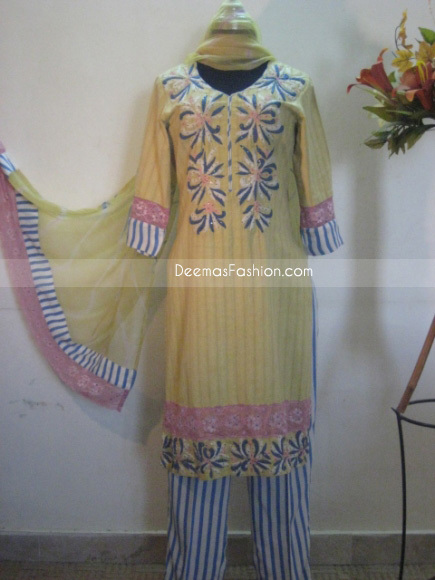 Yellow pure chiffon shirt has been endowed with eveluated embroidery on bodice and hemline. Embellishment work includes thread, sequin and beads work. Beautiful floral lace implemented before hemline and bottom of sleeves. White and blue fabric used as lining/under shirt. Dupatta: Yellow pure chiffon dupatta finished with lace and white blue lining fabric on edges.